While it is common to associate the term contagious with a viral illness like the cold or flu, there is a very common dental health condition that can spread from person to person too. Did you know that tooth decay is contagious? To be more specific, the bacteria that causes tooth decay is contagious and can be passed between two people like a bad cold. In fact, it happens all the time! To understand how you could give your friend or family member tooth day, let’s take a closer look at how cavities form. Contrary to popular belief, sugar is not the only culprit to tooth decay. Cavities are caused by certain types of bacteria that feed on the sugars in your mouth. During this process, acidic byproducts are produced, which eat away at the hard enamel of the teeth and result in cavities (or tiny holes). The bacteria that cause cavities are referred to as S. Mutans. People are not born with this type of bacteria. Rather, studies show that most kids “catch” this bacteria from their parents or caregivers. By age 2, nearly 80% of children have a detectable level of decay-causing bacteria. By simply sharing an eating utensil or quickly cleaning a pacifier inside your mouth, you may be transmitting the bacteria that causes cavities. While limiting the sharing of food with your child is the first line of defense, it is also important to practice good oral hygiene yourself. Ridding your own mouth of harmful bacteria can prevent the spread of cavities to your child as well as other adults – especially if your toothbrush snuggles with your spouse’s toothbrush all day long. Do yourself and the people you care about a favor and make your oral health a priority. Brush and floss daily and don’t skip out on your routine dental visits. 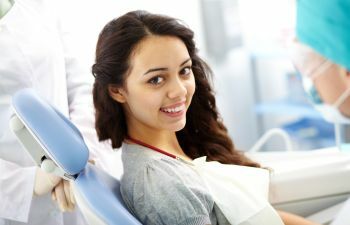 Contact Crabapple Dental today for a comfortable and rewarding experience in dental care!